This magnificent chronograph will be true friends to those who are in search of new research achievements and adventures; it does not disappoint its owners, even in extreme situations. 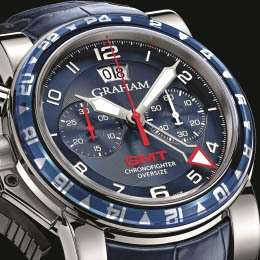 The novelty with its design is similar to previous models of brand Graham, which combines the latest technologies of the watch industry. 47 mm round case of the Chronofighter Oversize Black Sahara watch is made from steel with black PVD coating. The case is equipped with a black ceramic bezel. On the left side of the watch there are big crown and chronograph pushers, made in the form of a lever. The black dial features Arabic numerals and the size of the number "12" is significantly different from the size of the remaining digits. Time indexes and hands are coated with luminous material in beige. Chronograph counters are located at the 3 and 6 o’clock positions. The small date aperture is located between the marks 8 and 9, and the brand logo adorns the dial at the 10 o’clock position. The black dial is covered by a convex double-sided anti-reflective sapphire crystal. The back of the watch is protected by sapphire glass so that the operation of automatic movement G1747 on 25 jewels, with a frequency of 28,800 vibrations per hour, power reserve of 48 hours. The caliber is equipped with features hours, minutes, seconds, date display and chronograph. The model comes on a beige fabric strap with a black ceramic buckle. The watch water resistant - 100 meters. There are also other color options for this model: with a black strap and white numerals (Ref. 2CCAC.B03A), with a black strap and gray figures (Ref. 2CCAU.B01A-Chronofighter Oversize Black Forest), with a strap and khaki figures (Ref. 2CCAU.G01A) and gray dial with black strap (Ref. 2CCAU.S01A). To buy the Chronofighter Oversize Black Sahara watch by Graham is available for 5900 Swiss francs.